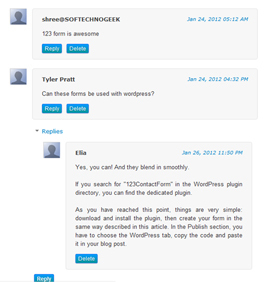 A month ago, Blogger released threaded comment system which is greatest feature so far. It allow users to reply to certain comment and make thread like structure of comment. But Threaded Commenting feature came up with some certain bugs like users directly landing up to the comment section after once complete load of a page. Some people might have noticed that the 'Reply' button of threaded comment is not working. For that, revert widgets temples to default and re follow the given instructions in this post. Playing with CSS and making your blog cool is hard task to do. Considering this, I have created CSS specially designed for threaded comment system of Blogger. You can watch the demo yourself in this blog (in the comment section). If you like that comment section style the follow the following instructions to use it in your Blogger blog. First you need to enabled threaded comment system. (If you already enabled, then please ignore this step). Please note: If you found 2 codes lines of given spinet, then you have to replace both. Now save the template and your are done! Go to one of your page which have comment and see if it works. Enjoy using cool threaded comment system. Please let me know if you got any problem.